The Hahoe Folk Village (Korean: 안동하회마을) is a traditional village from the Joseon Dynasty. The 'Ha' is short for river and 'hoe' means to 'turn around, return, come back." The village is a valuable part of Korean culture because it preserves Joseon period-style architecture, folk traditions, valuable books, and an old tradition of clan-based villages. The village is located in Andong, Gyeongsangbuk-do. To the north of the village is Buyongdae Cliff while Mt. Namsan lies to the south. The village is organized around the geomantic guidelines of pungsu (Korean feng shui) and so the village has the shape of a lotus flower or two interlocking comma shapes. The Ryu (or Yu in some transcriptions) clan of Pungsan established the Hahae Folk Village in the 16th century during the Joseon Dynasty and has been a one-clan community since that time. The village is notable because it has preserved many of its original structures, such as the village Confucian school and other buildings, and maintains folk arts such as the Hahae Mask Dance Drama ('Byeonlsin-gut') which is a shamanist rite honoring the communal spirits of the village. 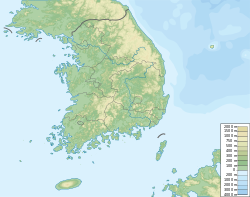 The village today is divided into Namchon (South Village) and Pukchon (North Village) with the main branch of the Pungsan Ryu clan, the Gyeomampa, in the Namchon side and the secondary branch, the Seoaepa, descended from Ryu Seong-ryong a noted prime minister during the reign of King Seonjo of Joseon in the Bukchon side. The north village contains Yangjindang Manor, designated as Treasure No. 306, and Pikchondaek House, designated Important Folklore Material No. 84. The south village contains Chunghyodang Manor, designated as Treasure No. 414 and Namchondaek House, an Important Folklore Material No. 90. While each branch of the Pungsan Ryu clan used lived in their respective manor homes and sides, today both branches live throughout the village. The village maintains old architectural styles that have been lost because of rapid modernization and development in South Korea. Aristocratic tile-roofed residences and thatched-roof servants' homes preserve the architectural styles of the Joseon Dynasty. Wonjijeongsa Pavilion and Byeongsan Confucian School are two notable structures in the village. The village has preserved the shamanist rite of Byeolsin-gut and preserved Hahae masks used in the Hahae Mask Dance. Another rite still practiced is the Jeulbul Nori which uses strings of fireworks fired at the base of the Buyongdae Cliff. Yongmogak Shrine houses Ryu Seong-ryong's collection of books and includes South Korean National Treasure No. 132, the Jingbirok, a book which records the Imjin War of Korea in 1592. Treasure No. 160, Kunmundungok, is a record of the military encampments. Chunghyodang also holds 231 royal writs of appointment. The mask play, which has been played in Hahoe-ri, Pungcheon-myeon, Andong City, North Gyeongsang Province, is National Intangible Cultural Festival No. 69. The origin of this mask play is Seonangje's mask dance, which is an involuntary dramatic victory observed in Dongje, unlike Sandae Myeonghwajeon, a Korean traditional mask play. Byeolsingut is a play that is included in the overall village rite, but has a dramatic independence. 'Sunyu Line Fire' is a folk game in which people hang a bag filled with charcoal powder on a long string hanging in the air and enjoy a spectacular event in which flames come on fire. In Andong's Hahoe Village, the aristocrats went boating together with a poem and a song under the full moon in July. At this time, he enjoyed pouring oil on egg shells or buppy pieces and flying them with a wick, or dropping pine tree stems that had been lit on Buyongdae. ^ "World Heritage in Korea". ^ "Andong Hahoe Folk Village". ^ "Koreana - Autumn 2012 (English)". This page was last edited on 13 August 2018, at 15:41 (UTC).